Speaks in Movie Lines: Thursday Movie Picks: Dance Movies? Thursday Movie Picks: Dance Movies? 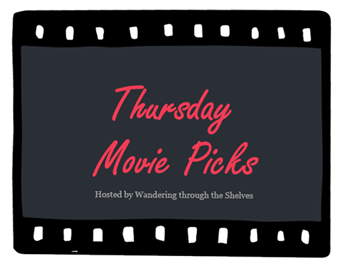 I could pretend that I have some recommendations in this category for Wandering through the Shelves Thursday Movie Picks Meme, which is Dance Movies (Excluding anything Musical or based on a Musical). But I've got nothing. You can read on anyway. P.S. I promise I'll be back next week with a real post. Thanks. That's my childhood up there. You haven't seen anything that has dance at all? Oh, sure. I actually have come up with a few cool movies that feature a dance scene, but I honestly just haven't had time to put anything together. Just too busy at the moment. This was what came to me when I did have time last week to put something together. I just got stuck and this is what happened. I am definitely not in the habit of seeing "dance movies" though. I have seen very few and liked pretty much none. I think Brittani said it all! Thanks. I hit a wall and this is all I could think of. Too busy this month. My brain is mush. You haven't seen ANY dance movies?!?! LOL, go watch Black Swan, Billy Elliot and The Red Shoes now! Yeah. I've seen Black Swan but didn't like it that much. I've seen Dirty Dancing but not since I was probably 12. I haven't seen Billy Elliot or The Red Shoes. I could check those out when I get some time. I was gonna try to stretch the category and do some good picks, but, honestly, I'm in the busiest month of my work year, and I barely have time to eat let alone think about movies. I blanked when I went to put this post together and 90s Country was the only thing I could think of. LMAO - this post wins the internet! I knew this would work on at least a few people. Haha, I kinda felt like this last week with Teen comedies. Yeah. Sometimes we just don't have it. Well dance movies aren't for everybody but I love your solution! Very inventive. Haha! Thanks. I truly have just not seen enough to recommend. There are some truly great dance scenes though. The Scent of a Woman tango scene is on my mind right now.